Mary Elizabeth Williams is a writer that I've "known" for more than 10 years. I've never met her, but I know a lot about her, her kids, her career, the things that are important to her. She's the moderator for a forum that I've participated in since 1998. She's taken a fair amount of abuse from members over the years when policies and formats change, and weathered it all with admirable stoicism. She's still there. So while we have lived as virtual neighbors for a long, long time, her meatspace home is in New York City. And while I've lived in Chicago (suburbs) and Seattle (suburbs), my midwest-small-town roots never show quite as much as when people start talking about living in NYC. I don't get it, I can't grasp it. I've been there once or twice and my overwhelming impression is that I never want to go back unless I win the lottery, and not a measly 1 mill pot, either. 50 million might do it. It seems like a really wonderful place to live if you make a lot-- and I mean A LOT-- of money. It doesn't even seem, to me, like a good place to visit on any kind of a budget. Frankly, it intimidates the CRAP out of me. 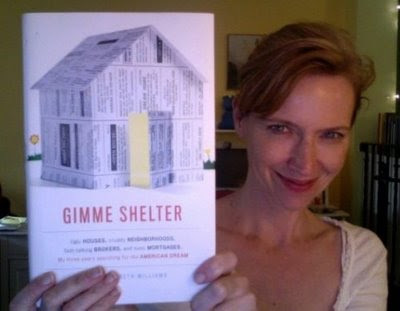 Mary Elizabeth's first book is due out March 3, called Gimme Shelter. It's about looking for a place to live in NYC. Getting great reviews. I believe it must have a happy ending, because her blog is loosely focused on how much she loves her neighborhood. It's kind of not my thing, and it's not Alpha Heroes' thing, but if you enjoy memoirs, adventures in real estate, and/or books about living in New York City, I encourage you to check it out. Doesn't she look happy? You know, I have noticed that people either love NYC or don't. There is very little in between. Yeah, there's a reason why it is so desirable and therefore expensive to live in NYC, it is awesome fun!